In one's life, you're better off following the teachings of Jesus or Buddha to gain long-term happiness. But the sad fact is, many people live by a very different set of rules, and while most of these folks eventually self-destruct, they can inflict severe damage on our personal and professional lives in the process. These laws are a good primer for learning how these people think. OnePowerfulWord.com is doing a series on how you can become more powerful and influential at work, in your group of friends or in general in life. The series will outline the laws which you need to be aware of to become powerful in this world. The laws are amoral, cunning, ruthless and instructive. They have been gathered by research of over three thousand years of the history of power and are based on the book 48 Laws of Power. Each of the Laws will be accompanied by a story or a detail which make the meaning/application of the law more practical for your day to day living. While we are doing this series I will also be giving out free PDFs of "The Art of War" by Sun Tzu and "The Prince" by Machiavelli. This series will give you a strong foundation in understanding how powerful people exploit you and how you can foresee things and be proactive. Subscribed to this blog by email, share this with your friends and encourage them to join as everyone could avoid being manipulated and learn something about becoming powerful. 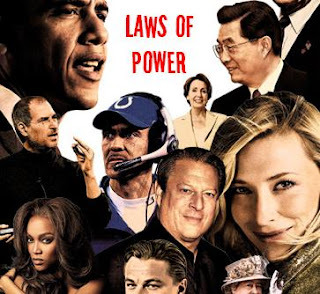 FREE Subscription - Click here to get articles like ' The Laws of Power: How to Become Powerful and Avoid Getting Manipulated ' in your Email.